Two magnificent old houses in the city of Burdur in southwest Turkey have recently been restored are both outstanding examples of traditional architecture, dating from a time when extended families of three generations lived together under one roof. The ground floor consists of a byre for livestock, hay store, larder and similar service areas, while the living quarters are situated on the upper floor. 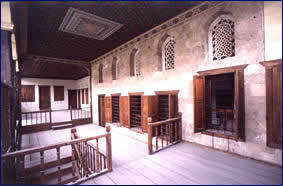 In addition to the private part of the house, known as the harem, there is a room known as the basoda (main room) or selamlik, where the master of the house conducted his business affairs and received his guests. The basoda was the most important room in the house, and you are left in no doubt of this by the ornate decoration and finely worked fittings. This room has two demarcated areas reflecting the status of master, guest and servant. The most prestigious area of the room was the raised section surrounded by a balustrade, into which only honoured guests were admitted, the lower area being used by other guests and servants. The harem where the family spent their daily lives consists of individual rooms opening on to a large gallery known as a sofa which runs along the side of the house. The rooms were used not only for sleeping, but served as the private apartment of their occupants, who also used them for sitting and eating away from the rest of the family. The sofa was both an access area to the rooms and a communal area where the family gathered together and spent most of their time, particularly in summer. At one end of the sofa is a section known as tahtabos where members of the family sat together and guests were entertained. Although the earliest title deed record dates from 1890, architectural features of the house suggest that it may have originally been built much earlier. The same applies to Kocaoda. Both houses were purchased by the Ministry of Culture in 1988 and restored. A double doored gate covered by a pitched roof leads into the grounds of the house, which is constructed of stone, adobe and wood. The eastern wall of the basoda and the stable area which has a pointed archway and is open on two sides are made of tufa. A wooden staircase leads up to the sofa on the second storey. Rooms lead off the south and west sides of the sofa, and to the north is a raised area known as the kösk. There are wooden lattices in the exterior walls of the sofa, so providing privacy for those sitting there, while preserving its airy character. The extended eaves of the main roof cover the sofa. The ceiling is decorated with painted designs and gold and silver leaf, the decoration being particularly ornate over the kösk and at the entrance to the basoda. 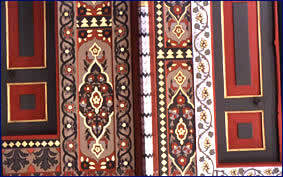 Motifs in various shades of blue are painted above the doors and windows. Light streams into the basoda through the many windows. It has fitted wooden cupboards and a chimney hood over the fireplace. The ceiling and window frames again have painted decoration richly highlighted in gold and silver, as appropriate to the most important room in the house. On the panels of the doors and window shutters are Ottoman Turkish inscriptions praising the house and its owner. The stained glass upper windows have plaster tracery. A secret door inside the cupboard leads into the adjoining room. On the south side of the gallery are two rooms, one large and one small. The rooms were heated by open fires and by braziers. 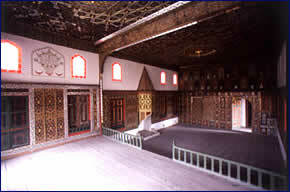 Kocaoda, the second house, is also known as Bakibey House. According to the records it was built in 1830 by Resit Bey, but again this may not reflect its original construction date. This is one of the loveliest historic Turkish houses to have survived. The two-storey house has a stone foundation, with walls of wood and adobe. The pitched roof is covered with gutter tiles. Again the lower floor is reserved for livestock and storage areas. A stone staircase leads up to the second storey, where a long narrow sofa runs along one side of the building. The rooms all lead off the south side of the sofa, which has a kösk or seating area whose ceiling is decorated with the motifs typical of the period.